Susan G. Komen Southwest Florida introduced Bracket Ears in this years’ silent auction at our Second Annual Pink Promise Luncheon. This over 400 person luncheon is held at the Ritz Carlton Beach Resort in Naples from which all the proceeds benefit Komen Southwest Florida in the fight against breast cancer. Bracket Ears was a wonderful addition to our silent auction bringing something new, fun and out-of-the-box to the event and helped raised hundreds of dollars for the organization. The money raised at events like these allow Susan G. Komen Southwest Florida to give back by funding community-based programs, with 75 percent of the net proceeds granted out to local non profit organizations in Southwest Florida to provide breast health services like mammograms, diagnostics and surgeries to uninsured and under-insured men and women locally. The remaining 25 percent is granted to the Susan G. Komen research fund getting us one step closer to finding the cures through ground-breaking international research. We are so grateful for Bracket Ears support and look forward to working with them in the future. Thank you Bracket Ears for helping us in our fight to end breast cancer, forever! Thank you for your participation in ROAR for Autism 2015. With the help of BracketEars and other supporters, this year’s event raised nearly $125,000 for autism research at Kennedy Krieger Institute. Kennedy Krieger is a non-profit organization dedicated to helping children and adolescents with disorders of the brain, spinal cord and musculoskeletal system achieve their potential and participate as fully as possible in family, school and community life. ROAR for Autism is 5k run, low mileage walk, and family festival that raises money for the Institutes’s autism research and treatment initiatives. We appreciate your donation and look forward to seeing you next year! 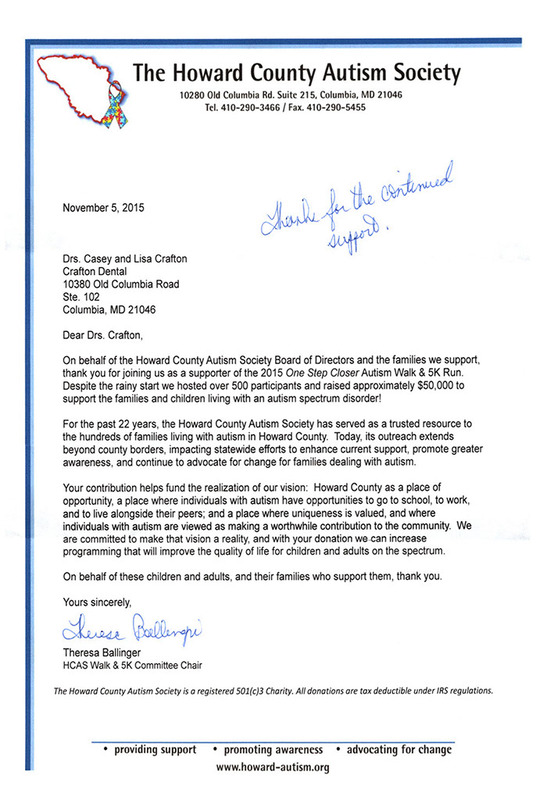 On behalf of the Howard County Autism Society, I offer our sincerest thanks for your generous donation to our tenth annual Pieces of the Puzzle Gals, held April 18, 2015. This event is our greatest fund-raiser of the year and we raised close to $20,000 through our Live and Silent Auctions. The proceeds will allow us to continue to support individuals with autism and their families in Howard County through programs, social events and support groups.